Deep in the verdant forests of northern Guatemala, an exemplary crossover between field management and aviculture of techniques is taking place in order to nurture Scarlet Macaw chicks to independence. This initiative is part of a long-term project of WCS (Wildlife Conservation Society)-Guatemala, supported by the Loro Parque Fundación (LPF), for the conservation of the northern cyanoptera subspecies of Scarlet Macaw which, as implied by its scientific name, is differentiated by the greater extent of blue in the wings. 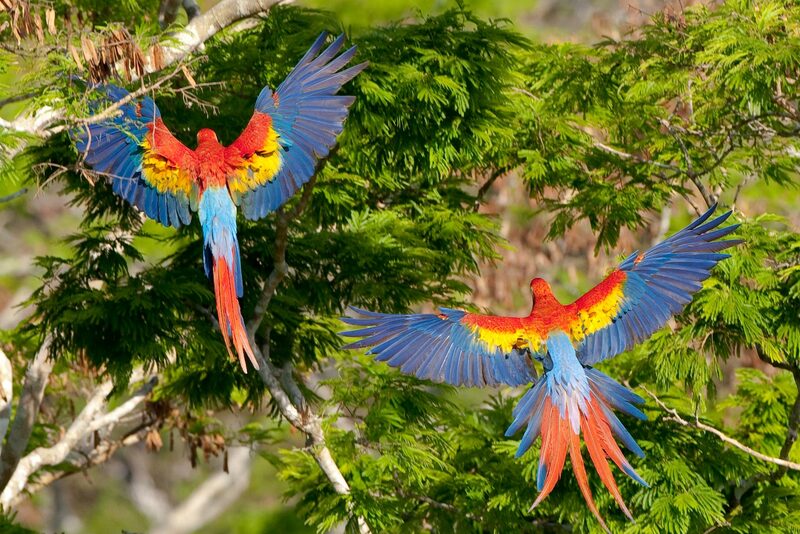 A pair of Scarlet Macaws in flight (Chris Packham/WCS). There is also another important distinction. Taking into account the huge geographical distribution of the nominate subspecies macao through South America north to Costa Rica, Scarlet Macaw is not recognised as a threatened species. By contrast, the northern subspecies, because of habitat loss and internal trade within its native countries, has disappeared from most of its former haunts and is threatened with extinction. For this reason, in 2002 WCS-Guatemala began the project in the Department of Petén, Guatemala, the area containing the most important remaining northern Scarlet Macaw nesting sites in the Maya Biosphere Reserve (MBR), especially El Peru, El Burral and La Corona. The project not only works to sustain the high concentration of active nests in this area, it also has importance to maintain the connectivity of northern Scarlet Macaw populations throughout the Selva Maya of Mexico and Guatemala, and potentially with the Belizean population. The project began by working to update the conservation status and identify key threats to the macaws and their habitat in the MBR. Alarmingly, it found poaching and habitat loss, largely driven by intentional forest fires and the expansion of human settlements, as significant factors threatening the macaw's continued survival, with the population having dwindled to fewer than 300 individuals. Adding to these threats has been the impact of nest predation by Collared Forest Falcons, nest infestation by non-native Africanized bees, and chick malnutrition which, given the small population, decreased recruitment to the population substantially. WCS-Guatemala developed activities to monitor threats aerially, combat fire, engage local communities through education and employment opportunities, educate decision-makers, strengthen year-round field patrols, strengthen prosecutions and improve nest monitoring. Sometimes the contents of a nest have been destroyed intentionally by persons unwilling to abide by the law, but in general the presence in the field of the project team members has deterred opportunistic poaching and the intentional setting of forest fires near the location of nesting sites. 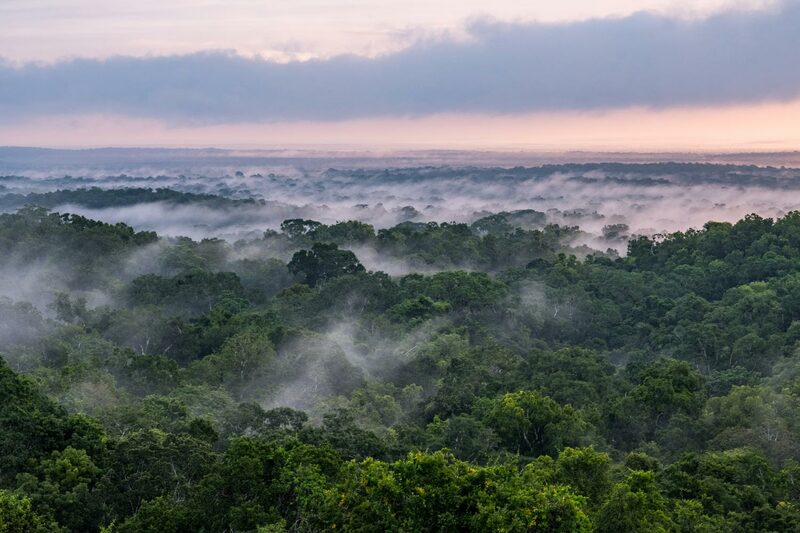 The spectacular Maya Biosphere Reserve, home to the Scarlet Macaw project (J Houston). The nest monitoring showed that the fledging success of monitored nests was highly variable between years in the period from 2002-2010, being as little as zero or only one chick per three nests at the beginning of that period. Thus, WCS-Guatemala decided to work directly on increasing chick survival, and thereby to increase macaw population recruitment and promote population recovery in the MBR. The monitoring of chicks within their nests found that predation by Collared Forest Falcons was having a serious impact on macaw recruitment. The design of falcon-resistant artificial nest-boxes, some double-chambered, and improvement of natural nesting cavities reduced predation and helped to increase nesting success. The project also instigated the use of bee repellents to reduce the impact of nest infestation by non-native bees, which decrease Scarlet Macaw chick survival. To further increase chick survival, WCS created a specific protocol to decide when to remove a chick from a wild nest (to prevent its death) and raise it in a field laboratory, and how to return it to a foster nest, also in the wild. The criteria to provide supplementary feeding (with commercial hand-rearing food) to one or more chicks from a nest are that either one or more chicks present signs of malnutrition, or if the weight difference between chicks from the same nest is so large that competition conditions for food from the parents are not equal. The nutritional condition evaluation is based on the chick's body condition; evaluating the pectoral and other muscles on a scale of one (1 = poorest condition) to five (5 = obesity). If the condition value is less or equal to 2.5, the chick is considered to be malnourished, and a candidate for supplementary feeding. In addition to the body condition evaluation, the size of the other chicks in the nest is taken into consideration. If a chick weighs less than two-thirds of the biggest chick, it receives supplementary feeding, even though its own body condition does not indicate malnutrition. The protocol helps to decide if supplementary feeding takes place in the wild nest, or if chicks are removed, fed in the field laboratory and later replaced in wild nests. 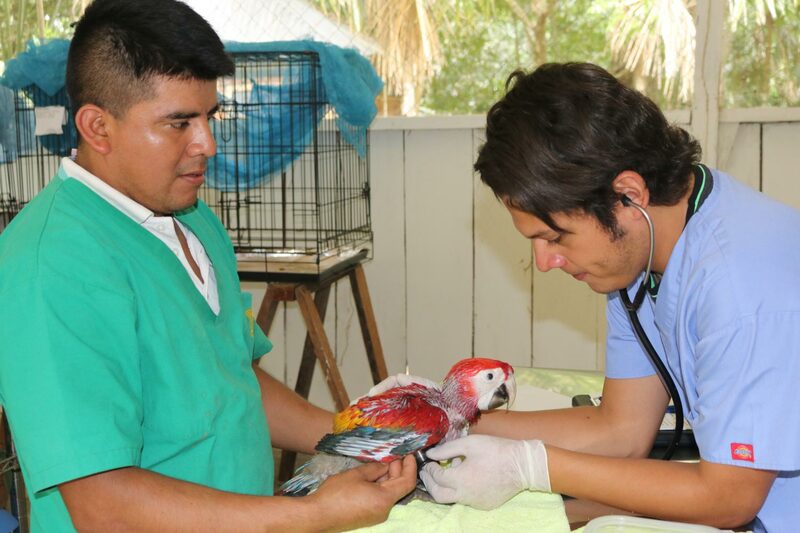 Vets assess a Scarlet Macaw chick (WCS Guatemala). The protocol was successfully tested in 2011 at nesting sites in El Peru and El Burral, and it increased population recruitment by adding seven chicks that would have died without the project's intervention. The LPF became involved in 2012 to support the wider application of the protocol, and the resulting strengthening of recruitment to the wild population of macaws. During 2012 the protocol was applied to 21 chicks, and 15 were returned from the field laboratory to wild nests where they successfully fledged, representing almost a third of the 49 fledglings for that year. In the succeeding years to 2018, the variation in the fledgling success between years has reduced since the pre-2011 years. The trend is moving in the right direction, and the project is continually adding refinements to the protocol. These now include the soft-release of laboratory-raised macaws back into the wild following their preparation in an in situ flight cage, as well as increasing the availability of nesting cavities by enlarging natural holes to create potential nests. The techniques used and refined in this project are not only good news for northern Scarlet Macaws, but are also being shared as best practice to be replicated in other psittacine conservation projects world-wide.